Ten years ago a green and white envelope arrived through my letterbox. Aged 26 I was happy and grateful for what I had and was looking for ways I could give back and help others in need so I signed up to ChildFund Ireland requesting to sponsor a child. When I opened the envelope and a picture of a dark skinned, brown eyed, dimple cheeked three year old boy fell into my lap, a big smile spread across my face. ‘We are delighted to introduce you to Shaban, your sponsored child’ the accompanying letter warmly informed me. Shaban was from Uganda, a country I had tenuous ties with as my brother’s best friend was from there, but other than that I was unfamiliar with the small African country dubbed the Pearl of Africa. 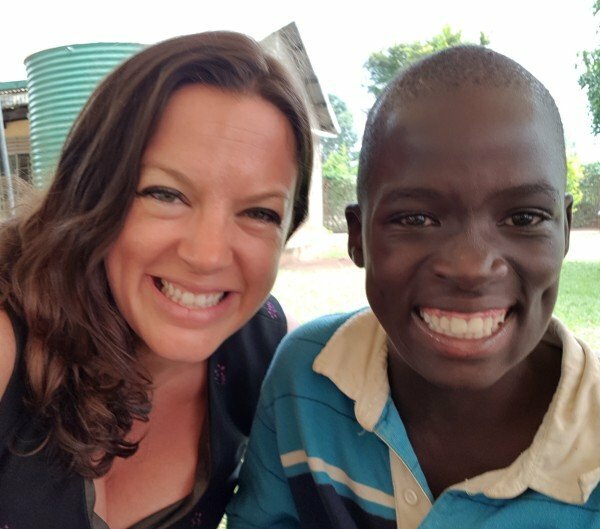 The information pack informed me that Shaban was from one of the poorest areas in the country, and for just €22.00 per month my sponsorship would help to fund his vaccinations, healthcare, and education. My sponsorship would benefit his whole family, and indeed the whole community in some ways. For the price of four cups of coffee a month, a boy’s life was being made better. Though thousands of miles away I already felt a connection to this little boy and felt thankful that I was fortunate enough to be able to help him. A few months after receiving my intro pack another letter arrived through the door, it was the first of what would be many letters I received from Shaban. His early letters were update reports, no doubt written by a community member updating me on his progress accompanied by little childish drawings of colourful balls and scribbles. As time went on these letters were written by Shaban himself, his English and handwriting improving with every year that passed. I learned he loved football, his favourite colour was red, he helped his mother fetch water after school and he loved his brothers and sisters. Occasionally I would write back but not as often as he did. Perhaps the cynic in me thought he wouldn’t receive the letters. Perhaps I felt embarrassed about my seemingly privileged westernised life. Perhaps I was just lazy. I should have written more. Over the years I moved job, moved house, moved country several times but I always maintained my sponsorship of Shaban. I made sure to update ChildFund of my change of address so I would continue to receive his letters, each one allowing me to get a glimpse into the happy young man he was becoming. 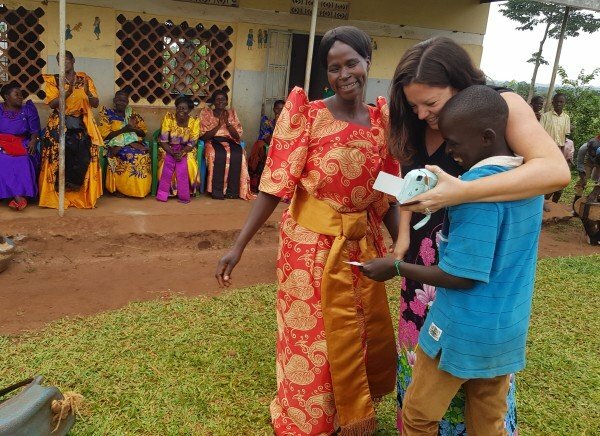 When my brother’s best friend invited me to his wedding I was thrilled to find out it was in Uganda. I immediately contacted ChildFund to see if I could arrange a sponsor visit. The Dublin office were as excited as I was, and couldn’t have been more helpful scheduling my meeting with Shaban and his family. Of course, ChildFund go to great lengths to protect the children, meaning I underwent Garda vetting and various forms needed to be filled out, but it was an otherwise seamless process. Many of my friends and family donated clothes, toys and money so that I could bring three large suitcases filled with presents for Shaban, his family and the wider community. I even brought him a book about Ireland, along with a red Liverpool jersey with his name emblazoned on the back. 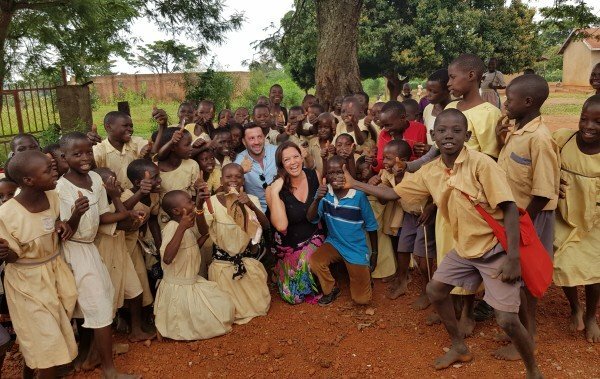 Ariana and Shaban surrounded by children from his local community, Uganda, August 2018: Photo courtesy of Ariana Dunne. On August 15th this year, my brother and I were driven the five hours from Kampala by the lovely ChildFund Uganda staff members. When we arrived all the women from the community, dressed in their finest colourful dresses, greeted us with chants and hollers, singing to us as we emerged from the car. Shaban was there to greet me, a dark skinned, dark eyed, dimple cheeked 13 year old, who gave me the warmest hug and the biggest smile. His mother, father, uncles, aunts, brothers and sisters all greeted me with love and hugs and immense warmth and gratitude that I had come to visit them. Shaban was my ‘sponsored’ child but there was no denying they made me feel part of the family. We spent five short hours in one another’s company but it is five hours I will never forget. My brother and I were shown around the community, introduced to each member of Shaban’s family, had songs and dances performed for us, a humble but delicious meal was prepared and we exchanged gifts after having greeted the excitable and giggling school children all vying to catch a glimpse of the pale skinned westerners. We took pictures, including ones with a Fuji Instax that developed like magic before their eyes meaning they had instant keepsakes of our visit. Though poor, and there was no denying the poverty, the community were rich in smiles and laughter. The cynic in me was abated. There was no denying that my sponsorship was benefiting Shaban and his family. There was no doubt that my connection with him was real. Through ChildFund I have the option of sponsoring him until he is 24 and has completed his education, an option I will most likely take. He could become a doctor, a lawyer, a local farmer, a famous footballer, or he may fall in love, start a family and live a happy and contented life like his father before him in the community where he was born. I’m grateful that for the sacrifice of four cups of coffee, or two overpriced gin and tonics, I was able to meet a wonderful little boy and his happy family thousands of miles away from Dublin and feel like I had made a small difference in the world. ChildFund Ireland would like to sincerely thank Ariana for sharing her wonderful experience and exemplifying the profound and meaningful relationship our sponsors have with the children they support.